Great news Florida! Planning for your next move just got easier. Move Matcher’s free service is now available in Miami, Boca Raton and Ft. Lauderdale to help people instantly find and compare verified moving companies online. Move Matcher has landed in the “Magic City” just in time for Cinco de Mayo. Whether your fiesta includes dancing to the beats of Miami’s top DJs at Mana Wynwood or comes in block party form complete with mariachi bands and authentic Mexican cuisine, at Move Matcher we’re all about providing options, and like the city of Miami we never disappoint. For a smarter, faster, easier way to plan your Florida move fill out the form in the top right corner of this page and receive real-time results from available moving companies. Your results will show Florida moving company quotes, consumer reviews and provide moving company availability all in the same place. Move Matcher puts you in control of your experience. The customer chooses the best companies from their results and calls businesses directly. This means no spam or unwanted calls, since your information is not shared with moving companies before you contact them. Move Matcher is also available in Austin, Chicago, Dallas-Fort Worth, Detroit, Houston, Indianapolis, Los Angeles, New York, and San Antonio. Find a mover near you. 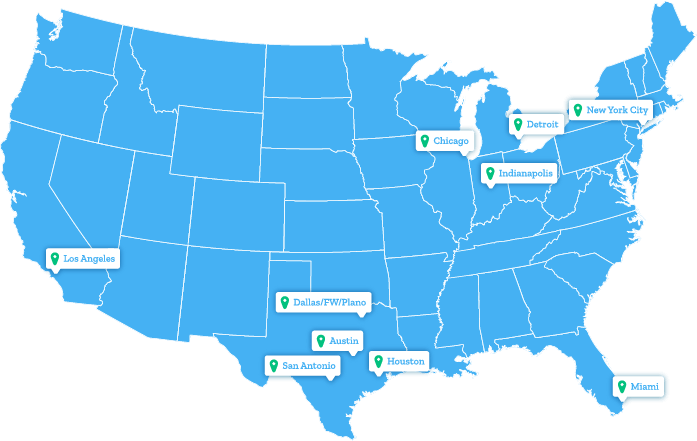 If we’re not currently in your area hang tight…Move Matcher is looking to expand to additional U.S. metro areas in late 2018. Keep up with us on Twitter, Facebook and Instagram.